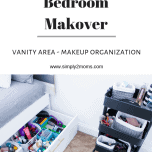 Follow these simple steps to design a beautiful bedroom vanity area. 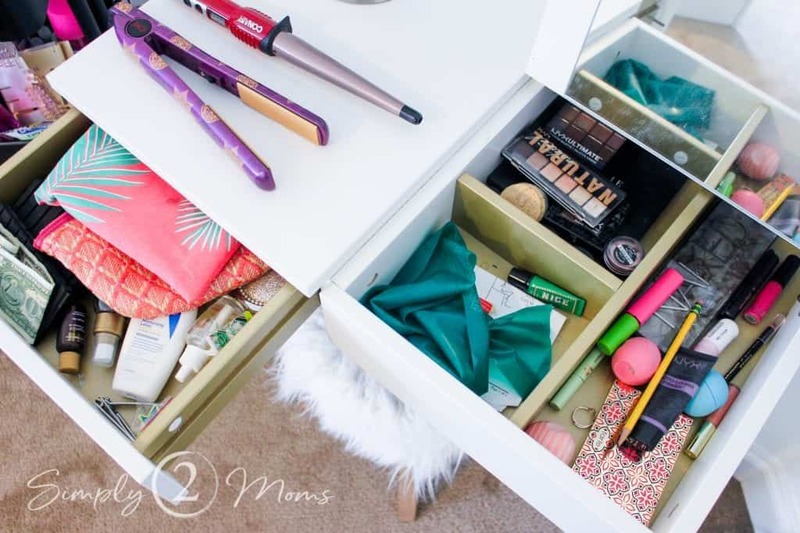 Organization for makeup and hair supplies along with pretty accessories creates the perfect space to get ready every day. 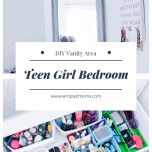 We finally finished my daughter’s teen girl bedroom makeover. Yay! There were several projects along the way. We updated light fixtures and hardware with paint and added a new gallery wall. The next project on our list was to redesign her vanity area. 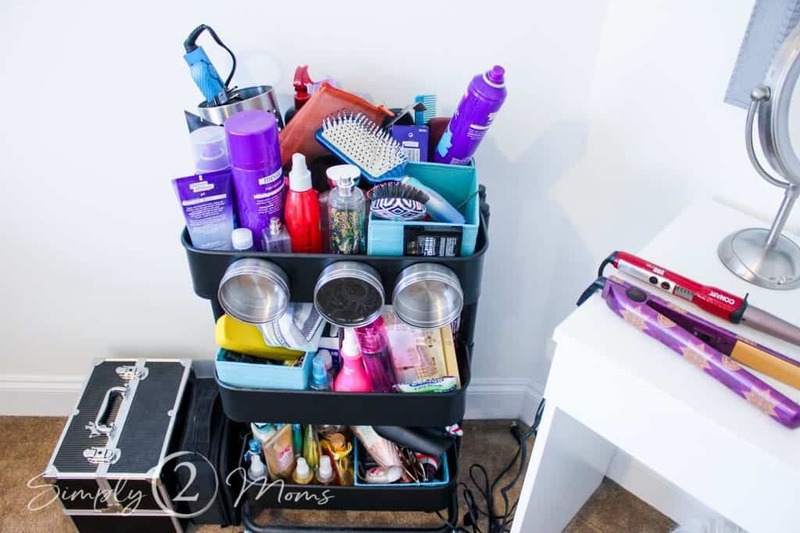 Yup, you read that correctly…redesign not design her vanity area. Maybe that’s why it’s taken so long to finally complete this makeover. Haha! She prefers to do her hair makeup in her bedroom because she shares a bathroom with her brothers. When we started this makeover, we bought new furniture from Ikea including this small vanity table. 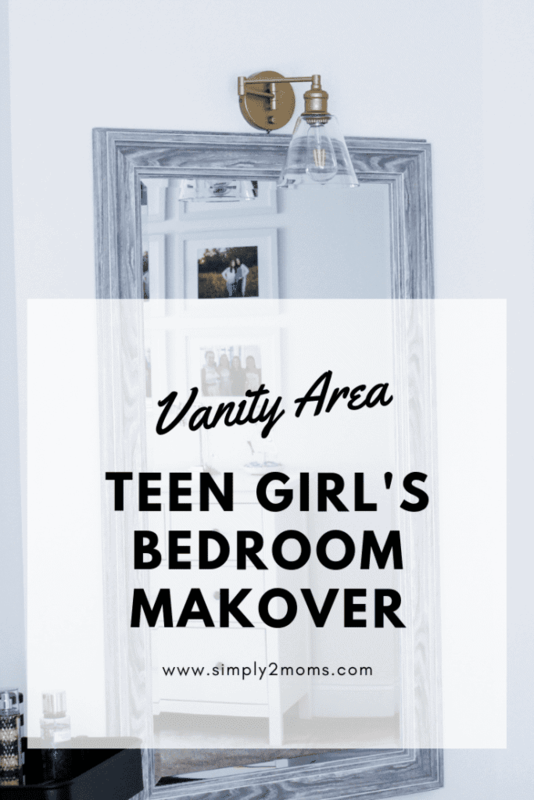 I thought I was done with her teen girl bedroom makeover but nope…let’s take a look at why we decided to redesign this vanity area. My daughter realized that she really likes to sit on the floor while getting ready. 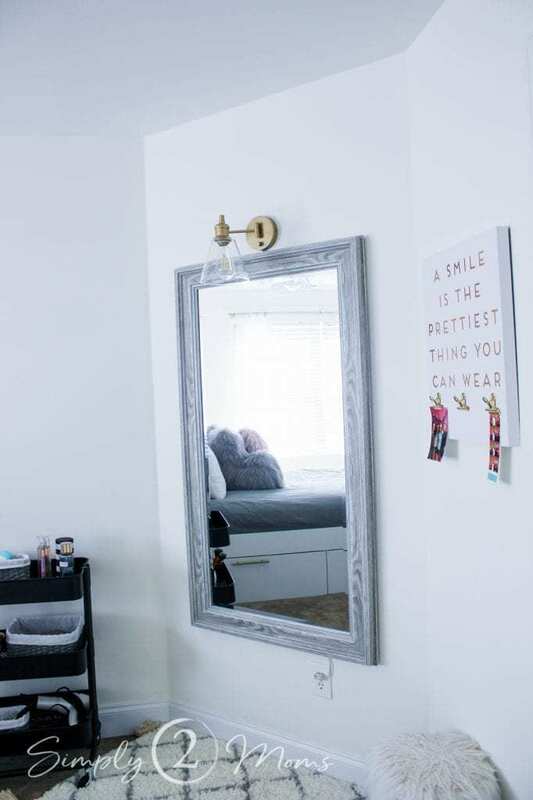 After months of using an old wall mirror propped against the wall with her supplies spread all over the place…we knew we had to figure out a better system. 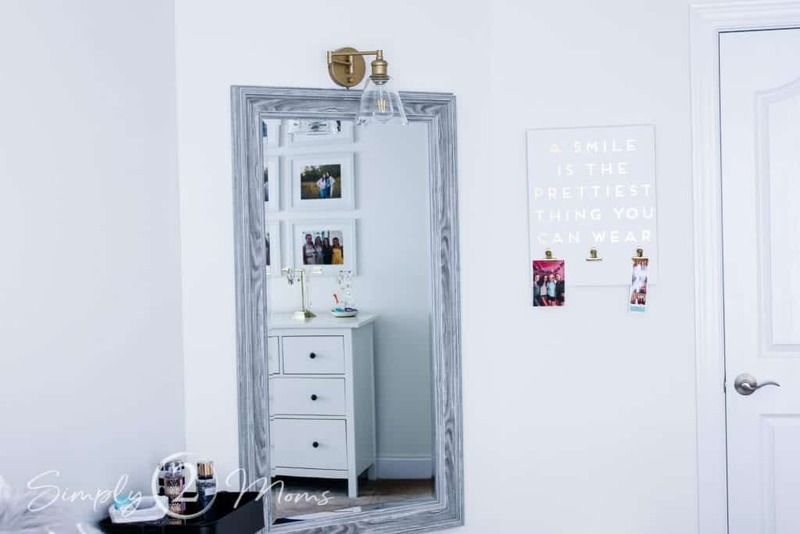 Since she likes sitting on the floor…that’s how we designed her updated her vanity area. We found the perfect mirror that coordinated with her pallet headboard to hang on the wall. 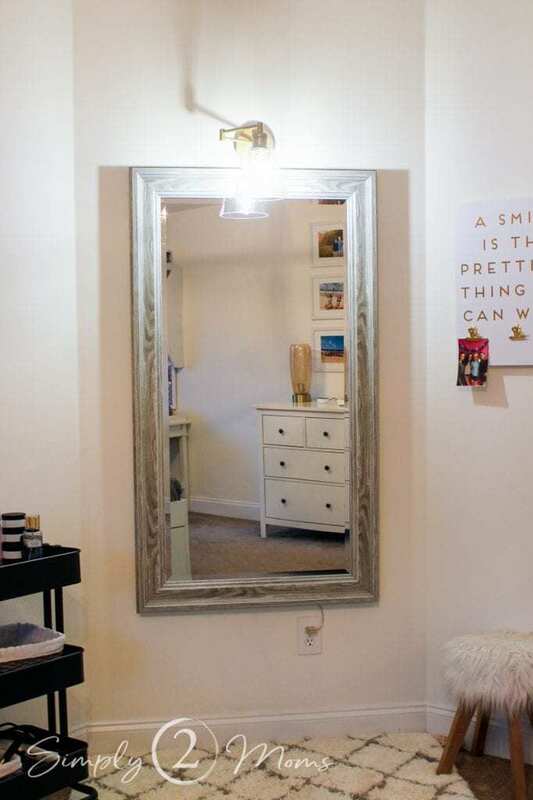 A plugin swing arm sconce was hung above the mirror. Easy & eliminated the need for hard wiring. Since the sconce was bronze we painted it to match the accent color used in her bedroom makeover. A fluffy rug makes sitting on the floor extra comfy! Next, we reorganized all of her makeup and hair supplies. We sorted the things she uses daily from the items not used as often. The daily stuff went onto the rolling cart with a few small lined baskets to help keep things organized. Hairbrush, hair dryer, curing & flat irons easily fit on the bottom shelf. 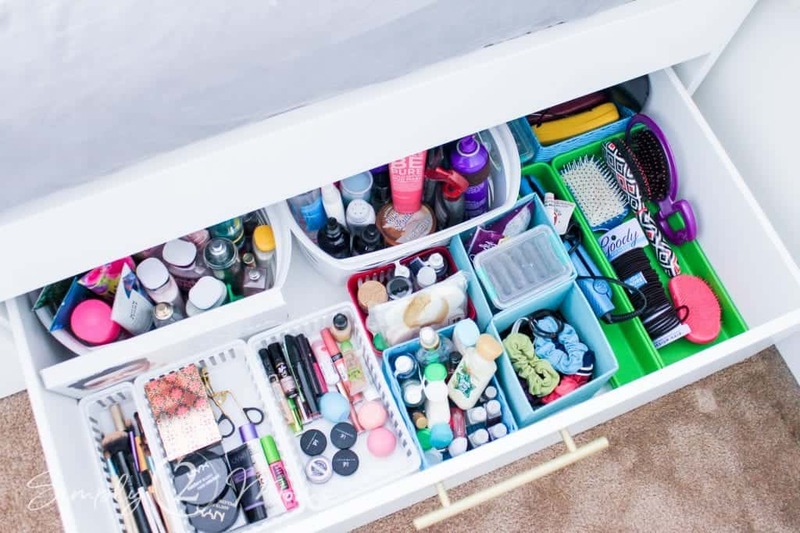 Makeup & makeup brushes are organized on the middle shelf. Finally, deodorant, scrunchies, perfume, and her wallet are kept on the top. 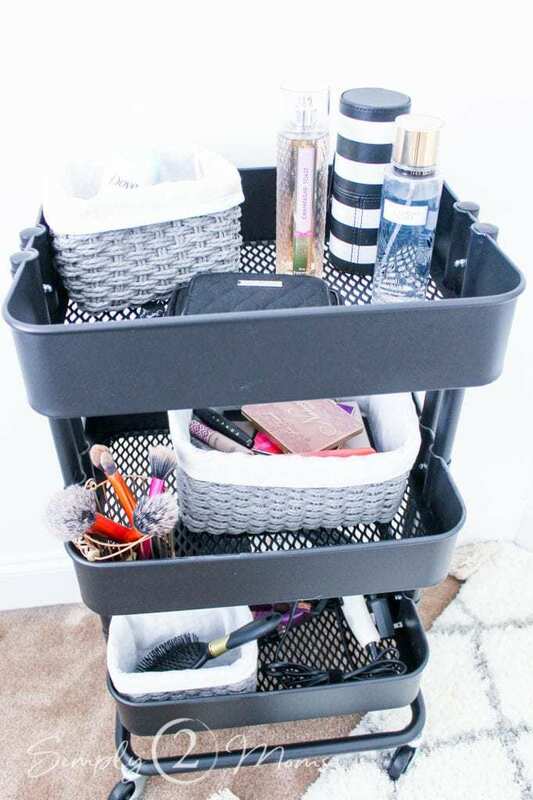 The rolling cart is so useful in her new vanity area but could easily become cluttered. I’m hoping if everything has a place then it will stay neat. Hey…a mom can dream, right?! Haha! 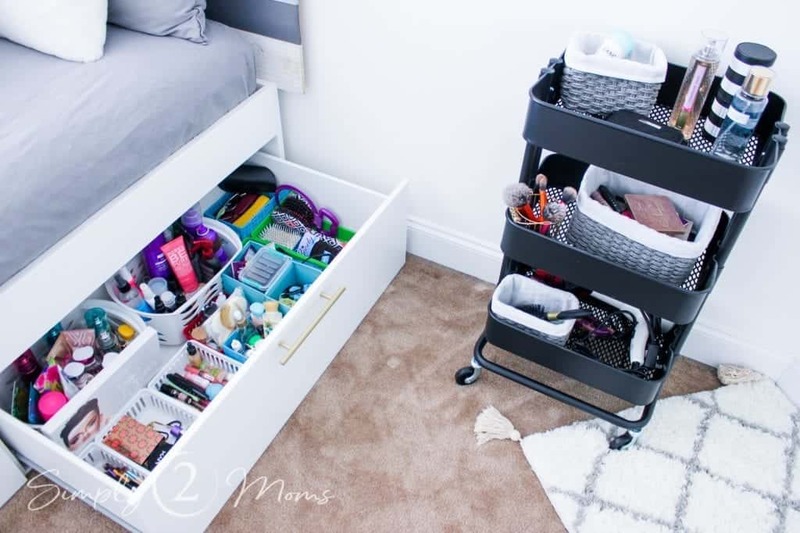 We used one of the storage drawers in her bed to contain all the other items in plastic baskets. It would be great to have new matching pretty baskets but this works just fine and we didn’t spend any money on this part of the project. Yay! The sconce provides plenty of light for applying makeup and she has everything she needs within reach. 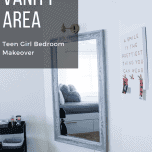 This new vanity area is working perfectly in our daughter’s teen girl bedroom makeover. 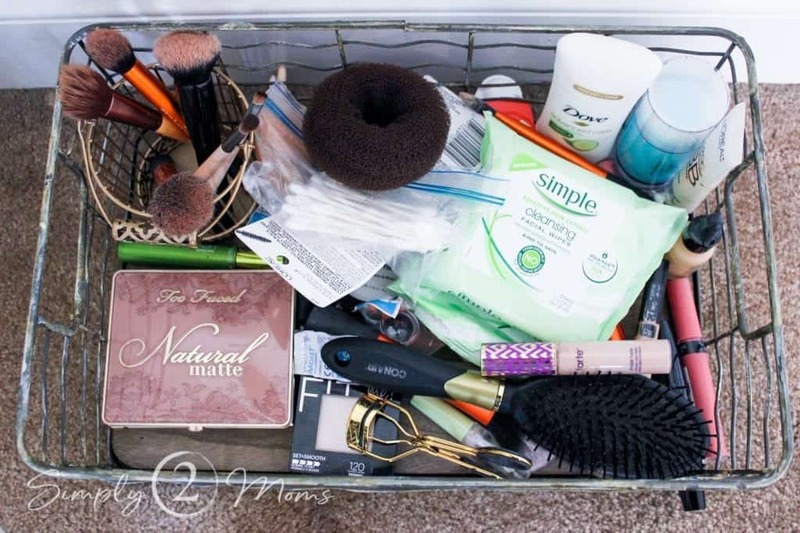 So, where do you get ready every day? Do you use your bathroom or your bedroom? You can easily recreate this look in your space too! 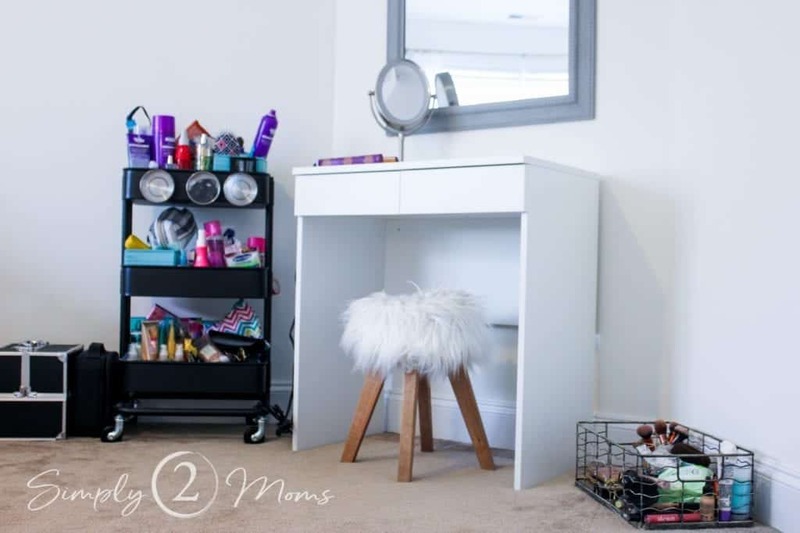 Here is a list of supplies you may need to design a vanity area.